The Story of "Maslow's Lens"
During the election campaign, I noticed that Kerry's supporters tended to be very vocally grass-roots, whereas Bush's supporters, while likewise eager for their guy, were less likely to do such things as protest or gather into larger groups. I'm making a generalization, and I could be wrong, but in my opinion, it's a tendency of Democrats to swarm together to accomplish a cause. Republicans tend to be less grouped about it. Within their own circles, they link arms. But I think Republicans as a group are less likely to be as obvious. In support of my argument, look at how it was the conventional wisdom that a larger turnout in the election would favor Kerry. Democrats find safety in numbers. They are concerned about the world's opinion of the US, where Republicans are more concerned about the our basic needs of safety and security - and screw the world's opinion if they don't like how the US secures itself. Whether you lean left or right, all of these are necessary and healthy to who you are. I read somewhere recently that the difference between a liberal and a conservative is the perception of the relationship between the individual and the state. Liberals see an important and close-knit relationship between the individual and the state, where conservatives regard such a relationship with less esteem. If you relate that concept back to Maslow's hierarchy, the difference between a Republican and a Democrat is that a Democrat is more likely to view the 3rd and 4th tiers in a broader perspective. Academic recognition, civil involvement, international acceptance... these are, in general, more esteemed by liberals than conservatives. To a firm Democrat, Maslow's 3rd and 4th tiers of acceptance and approval and community are integral to Maslow's 2nd tier of safety and security. Hence, "it takes a village." This is why Bush's foreign policy scares Democrats - it doesn't really care what the world thinks. "Safety and security in community." To a firm Republican, Maslow's 2nd tier is separate from and a precursor to the 3rd and 4th tier. Strong military, 2nd Amendment rights... rugged individualism doesn't really trust others to provide safety and security. This is why Kerry's foreign policy scared conservatives - the UN is the last institution they trust. "Safety and security - then community." Who's right? Actually, both, and I think timing is the key. At the moment, I find all of this fascinating to consider. Read the whole story of "Maslow's Lens"
Liberals give greater weight to Maslow's 3rd and 4th tiers, which are a sense of belonging and esteem from others, and they see this as important to Maslow's 2nd tier, which is Safety and Security. I summed this up as "Safety and Security in (or through) Community." Conservatives, on the other hand, see Maslow's 2nd tier as pre-emptive. First safety and security, then be concerned with a sense of belonging and esteem from others. I regarded this as "Safety and Security - then Community." You can read that post by clicking on the "View Thread" link up above. Thinking it through some more, there are two axes that brace this thinking. 1) Individual Responsibility vs. 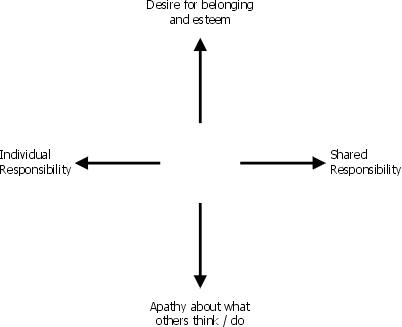 Shared, or Group, Responsibility. It's "Do It Yourself" vs. "It takes a Village." 2) Apathy about the opinions of others vs. wanting group decisions and a sense of moving ahead together. So I created a simple chart to represent these two arcs. At times, each of us occupies a position on either axis. 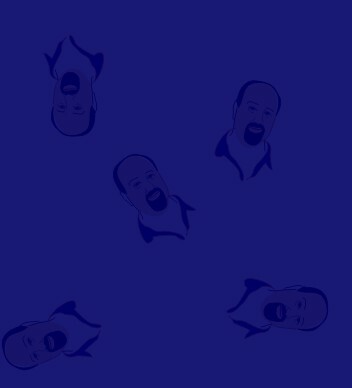 We can perch comfortably in any quadrant. There is a time for every position available. I mentioned the other day that acting alone for safety and security first is at times important, and that there are other times when acting in concert with others is best. But neither position is right all of the time. For example, a person could consistently give all of their money to others, and pay the most essential of their bills for themselves. That sounds wonderfully selfless, but it's well-understood that a person who saves their money can earn interest or dividends on the money saved, and thereby actually give more throughout their life because of their sturdy financial position. Safety and security through "selfishness" first - before concern about the opinions of others. There is a time to think first by yourself, and a time to think as a group. If a neighborhood in plagued by a redundant burglar, the people are best served by acting together and watching each other's homes rather than just watching their own. Safety and security through community is stronger for the numbers. From this, what makes for the best society? Where would America sit on this chart? 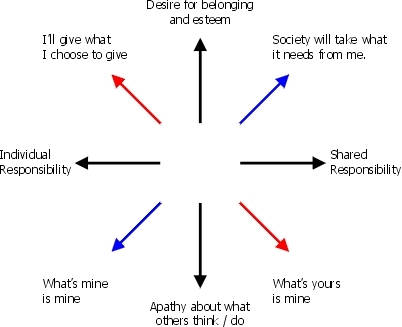 Where would you sit on this chart in your political and personal values? There are two general factors that combine to make a society vulnerable to collapse. First, stress and perturbation are a constant feature of any complex society. Yet a society experiencing declining returns is investing ever more heavily in a strategy that is yielding proportionately less. Excess productive capacity will at some point be used up, and accumulated surpluses allocated to current major operating needs. There is, then, little or no surplus with which to counter major adversities. Unexpected stress surges must be dealt with out of the current operating budget, often ineffectually, and always to the detriment of the system as a whole. Even if the stress is successfully met, the society is weakened in the process, and made even more vulnerable to the next crisis. Secondly, declining marginal returns make complexity a less attractive problem-solving strategy. Where marginal returns decline, the advantages to complexity become ultimately no greater (for society as a whole) than for less costly social forms. The marginal cost of evolution to a higher level of complexity, or of remaining at the present level, is high compared with the alternative of disintegration. Under such conditions, the option to decompose (that is, to sever the ties that link localized groups to a regional entity) becomes more attractive to certain components of a complex society. Many of the social units that comprise a complex society perceive increased advantage to a strategy of independence, and begin to pursue their own immediate goals rather than the long-term goals of the hierarchy. Behavioral interdependence gives way to behavioral independence, requiring the hierarchy to allocate still more of a shrinking resource base to legitimization and/or control. In short, efforts in constantly increasing the complexity of a society are ultimately doomed to fail, as history shows. Unchecked investment in complexity actually invites the breakdown of society because of the lousy return on ever-escalating cost. Finally, the people get fed up with it. In the past, this was achieved by bloody revolution or by the state's waning power and relevance. The one mechanism though that could change this is: democracy. Thoughts on that will be my next segment in this series. I've been looking at the difference between liberals and conservatives through the lens of Maslow's Hierarchy of Needs. And I've been wrong, I think. It's through the further consideration of this that I need to expand it. I had said before that liberals see safety and security through community. Theirs is the "It takes a village"/"safety in numbers" mindset. Safety and security are in Maslow's second tier of need. Physical needs are in Maslow's first tier. But I now believe that liberals see physical needs as a group responsibility as well. For example, they believe that the homeless deserve a home, and society could cover that expense. The unemployed should have money, and society could cover that allocation. Now, I'm asserting that Maslow's third and fourth tiers, which are "belonging" and "esteem," are represented by the concept of community. If that's correct, and if liberals really do believe that physical needs and safety and security are the responsibility of the community, then liberals have inverted Maslow's hierarchy. Humans are born into the first community: family. And if you look at it from this point of view, they're right. And a conservative will most likely believe that these are individual responsibilities. They see it as chicken and egg. How can an individual aid society if they themselves aren't secure? But in a fascinating way, a liberal would say, "Exactly! And the community should help firm up the person so that they can get back on their feet and help others." This is where the branching starts. Children are born into community and the community around them does provide their needs, but as they grow into adulthood, their independence is expected. What happens if they run into trouble? We all do, at times. A bit of assistance is sometimes helpful to society in the long run. Letting it run on and on though is not unproductive. It may sound odd to say it, but what benefit is there in domesticating humans? I'm sure you've heard concern before that if someone takes in a wounded wild animal, they actually threaten its chances for survival in the world if it is kept and fed for too long. The animal, accustomed to fending for itself in the world, becomes "tame" because it is so cared for every day. So how can a person responsibly release it back to its natural element? Keiko, the famous orca whale, is the most notorious example of this. Is this less so with humans? Some would argue - on both sides of the political spectrum - that prolonged welfare during the 60's, 70's, and 80's hurt people and society more than it helped. Society is strongest when each individual has reached above Maslow's belonging and esteem. Community is important and needful, but it is not enough. Maslow's concept of self-actualization serves everyone best. It means reaching our individual, full potential. Strangely, some liberals despise the high achievers of life. Not all - some very entrepreneurial folk are quite liberal. A good friend on mine, with whom I had lunch today, is both a staunch Democrat and is very involved in entrepreneurial pursuits. My question, though: how does a liberal mindset advocate individual achievement and contribution to the group? What happened to "Ask not what your country can do for you, but what you can do for your country?" I'm not trying to disparage anyone at all in this. I'm simply trying to understand how it is that people can both believe in the concepts of safety/security and helping one another, and yet arrive at totally opposite solutions. Yes, but I think a very strong definition of community is necessary. I don't consider Muslim extremists to be in my community. I don't consider those who hate America to be in my community. Wish harm on our military? You're not included. Community starts with a common interest. The greater the commonality and shared goals, the more I'll trust my safety and security and even physical needs to someone - be it an individual or a nation. Some liberals, it seems, want to include all of humanity in their community. Except that some of that "community" wishes that we die. Where's the common interest? It's silly to include such people in any community. Pull it back a little further... the French, the Germans, the Russians, the Chinese... they don't have our national interests at heart, do they? Why should we seek their advice or consent about safety and security? Why should we trust the U.N.? Why should they be included in a community? Shouldn't the goal of community be to strengthen society, its people, their livelihood, their quality of life? Is that what "belonging" and "esteem" is about?